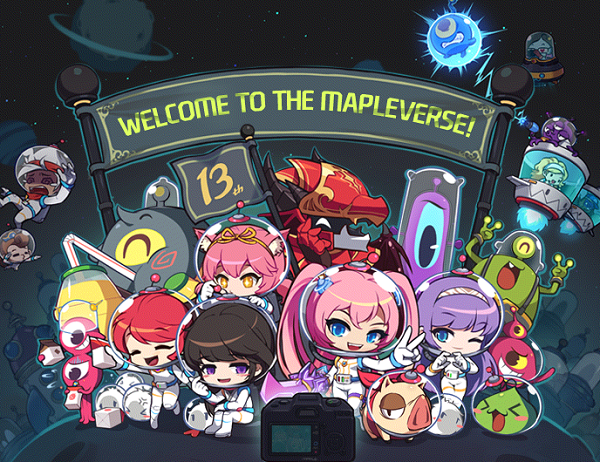 Are you ready for an 'out of this world' experience to celebrate MapleStorySEA's 13th Birthday? Well we sure are, with tons of pink anniversary related events and a whole new area to explore! The big evil spider, Commander Will in Esfera will now show his true form as will well! In addition, we have a special mission lined up, join us as we explore the mysterious happenings in the new Captain Vaga contents! 1. 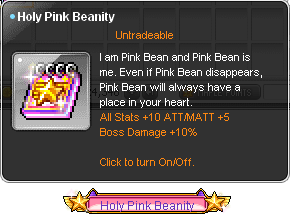 Pink Bean is Back! Pink Bean Loves a PARTY!! • Identified as a Male Explorer Warrior class. • Primary Stats is Strength (STR). 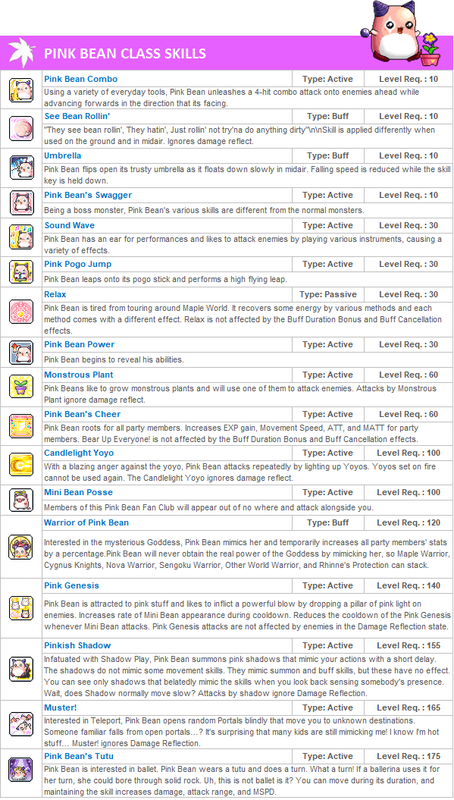 • Does not gain or require SP for skills, they are unlocked according to Pink Bean's level. 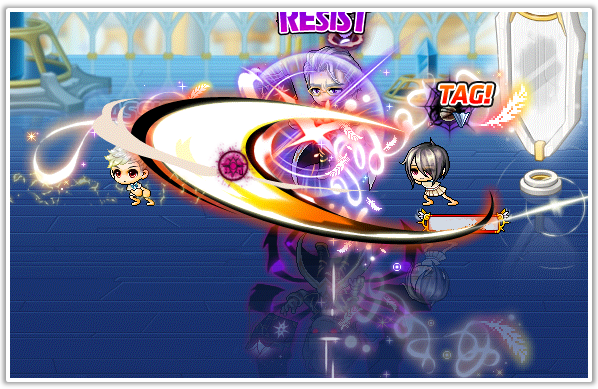 • Skill damage is proportionate to Pink Bean's level - more damage will dealt the higher Pink Bean's level is. • Pink Bean only comes in one look, no customization options during character creation. 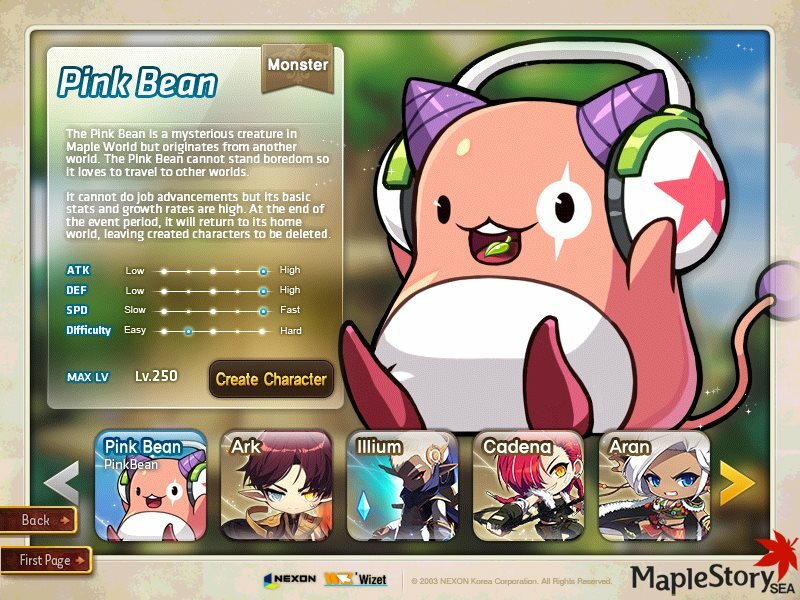 • Only 1 Pink Bean character can be created per Maple ID during this event period. • Can receive link skills from other characters, but does not have its own link skill. • Can join guilds but cannot create one, or be a guild master. - Maple Union (will still receive effects), Marriage, Professions, Ursus, Blockbuster Contents (Heroes of Maple, Black Heaven), Beauty/Cosmetic, Maple Auction, Meso Market. • Mileage can be obtained on Pink Bean, but settlement must be done in the Cash Shop with another character. • "But I don't have any more character slots!" We heard you! Refer to our System Updates for more information. 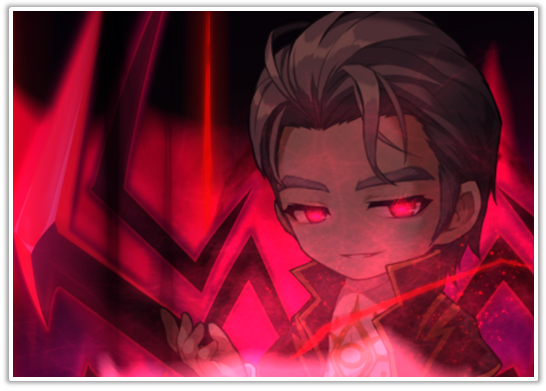 • At the end of the Event Duration, kindly note that ALL Pink Bean characters will be removed by Black Bean as his plans were thwarted badly, and Pink Bean will return to his own world! • Pink Bean has picked up some moves while he was away~ Now you can attack monsters by spinning & dancing! • Complete the Pink Bean's Secret Diary to obtain rewards! • Complete missions and receive various rewards for Pink Bean and special account rewards for characters of the same world! • There are a lot more rewards to be obtained, so bean away! • If you have created and leveled up your Pink Bean to level 100, you will be able to receive a Pink Bean Gift Box! To celebrate our 13 years of service, we bring you to the stars! Travel beyond the Maple World and discover that we're not 'alone' in the universe! How to Start: Accept the quest [13th Anniversary] Maple in the Universe from the Star Notifier on the left side of the screen or via NPC Kemdi. Once again, we bring back everyone's favourite point gauge that you may recognize from past events such as Discovery. Similarly, this gauge will be used for you to keep track of your Stardust that can be earned from the 13th Anniversary Events & hunting monsters! Stardusts will be automatically converted into Galaxy Stars which you can use in our Galaxy Star Shop for those 'out of this world' items & chairs that you can beautify yourself for our 13th Anniversary! May the galaxy be with you..
How to Start: Click on the Galaxy Star Shop Icon (in the star notifier icon) or click on Galaxy Star Vending Machine in Henesys, Leafre & Nameless Village. The universe is an endless dark sea of vacuum where nothing of value can be found... or can it? Kemdi has certainly found a way to bring exclusive items from the vastness of space as well as other exciting goodies! For 2 seasons, Kemdi brings you never before seen items as well as classic favorites enjoyed by Maplers and Aliens alike! Worried that you may run out of things to do while enjoying our 13th Anniversary Galaxy events? Fret not! There will be tasks to be done and goals to be achieved! 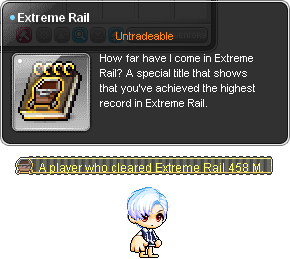 Take part in not just one, but 2 seasons of achievements lined up this Maple Galaxy Achievements and you can obtain an exclusive Title and a chair! • Receive Galaxy Star Coupons ranging from x50 to x150 Galaxy Stars for each Achievement you complete! • Receive Galaxy Star Coupons ranging from x50 to x200 Galaxy Stars for each Achievement you complete! Can I shoot lightning out from my fingers now? • The character that has done the most amount of damage to the monster will have ownership of the stardust obtained. Ever felt that just 'AFK-ing' in maps is a boring way to gain points? Now you get to do exactly that!...But in spaaaaaaace~ That's right! We're taking the classic 'afk' maps and putting it pretty and way up in space! However, there is now a little twist! Not only will you earn stardusts from just sitting around in Planet Vita, you can also earn stardust by enhancing your equipment via Star Force in that map to earn stardusts! Next time... I get to drive..
You're overreacti..*boom*..ok you may have a point..
Travel through the deep mines of Planet Minel on a cart while dodging dynamites that will blast your trip to a halt! • By tapping on the left & right arrow keys, you will be able to switch tracks. • On the way, you will be able to collect sparkly dusts worth 4 Stardusts! Oh no! These aliens are stranded on Planet M-426 and need help getting home~ Kemdi has offered his paws to help out, but he needs you to manage the 'evacuation', otherwise it will get messy! Just because I won doesn't mean I cheated..
- Each player will only have a short period of time to place a stone to discourage non-participation after matchmaking is complete. • In the hunting map, talk to NPC Tarrentu and summon monsters with Galaxy Stars! Not only can the planet talk, you get to collect seeds and bio-spheres from all over the Maple World to create the planet that you have always wanted! • After accepting the quest & moving to Planet Petite, there will be a detailed tutorial on the event. Do pay attention to what Planet Petite has to say! • However, there is a daily limit based on the level of your planet! With all these aliens being evacuated from Planet M-426, they'll need homes to settle down on their new planet~ And as expected and on cue, they have the materials to build them! But... they lack the tools to build them. That's where you come in! Let's see if you can create the tallest tower in the Mapleverse! • As you go higher, the layers will move faster. • For every floor layer that is not aligned, the floor layer will get smaller. • If you run out of time or if the floor layer misses the stack, the game will end. Mega Burning Project has returned, once again! But this time, you will be able to burn Cadena & Illium as well! Enjoy 1+2 Level Up all the way to Level 130! Requirement: Newly Created Characters, excluding ARK. Character must be selected as the Burning Character upon creation. What is Mega Burning Project? 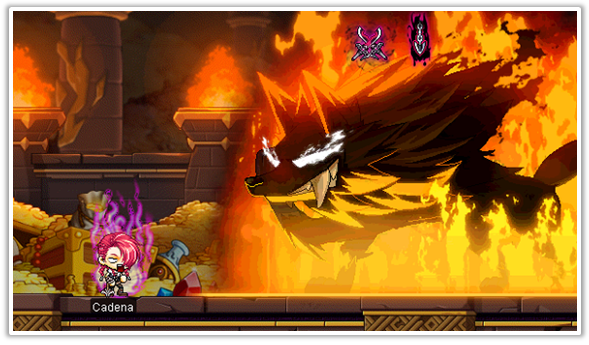 Burning Project is an event where characters can enjoy leveling at triple the normal amount! You will also receive various gift boxes on your burning character! → Open it up to receive a Snail Roon Pet! → You can open this box once you reach Level 30 to receive relevant equipments for your character! → This box can only be opened once you reach Level 100, to receive a Level 100 Set Equipment! → This coupon can only be opened once you reach Level 130, to receive a Keep On Burning Title, which consist of awesome stats for 14 days! Stay hot and burn on! How to Start: Enter via the Mirror Gate NPC located at the Mirrored Throne of Light, or via Boss UI Registration. Overcome your limits, and show Will who has a stronger will..!! 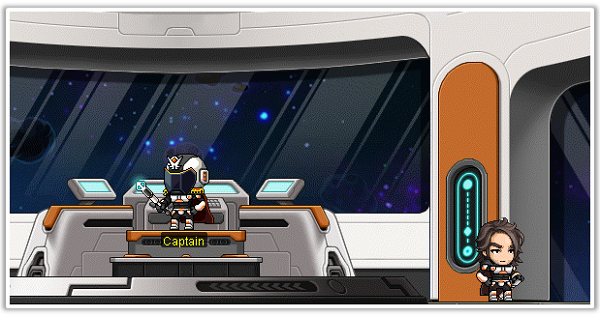 How to Start: Accept quest [Captain Vaga] The beginning of the story, in to the Stars. from the lightbulb icon on the left side of the screen. • Play as Dust, and join as Dust and Lapis as they embark on a journey to leave the planet they are on! • A mysterious spacecraft offers a job with a lot of benefits, including travelling to other planets. What's there to lose? • Join Dust and his friend Lapis, as they embark on different missions and partake in battles while unraveling the secrets this ship and company holds! The maximum amount of character slots per account has been increased from 43 to 44 (Pink Bean, anyone?). - Note: You can obtain a Character Slot Expansion Coupon from the Cash Shop for free. Character creation has been disabled for the following characters. Ark's starting town, Verdel, has been added to the Interdimensional Portal in Pantheon. Fixed an error where Resurrection Flames can be used on certain items that should not receive Additional Options.